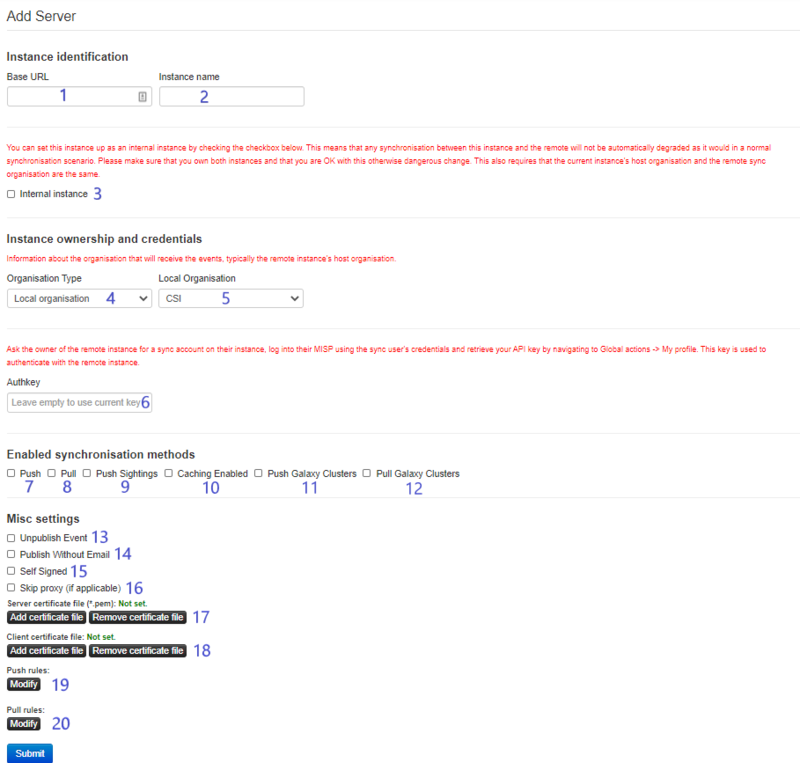 Synchronisation/Sharing · User guide of MISP Malware Information Sharing Platform, a Threat Sharing Platform. MISP&apos;s core functionality is sharing where everyone can be a consumer and/or a contributor/producer. The following figure shows the concept how different MISP instances could tie together. Use case 1: From another MISP server (also called MISP instance), by synchronising two MISP servers. Use case 2: From a link, by using Feeds. Step 1: Add OrgB as a local organisation on ServerA (OrgB.ServerA). Step 2: Add a Sync User (syncuser@OrgB.ServerA) in the organisation OrgB.ServerA on the MISP ServerA. Step 3: Set up a sync server on MISP ServerB using the key (called Authkey) from the sync user (syncuser@OrgB.ServerA) created on MISP ServerA. For additional information on the synchronisation process, refer to the MISP GitHub issues, for example, issue 2595. 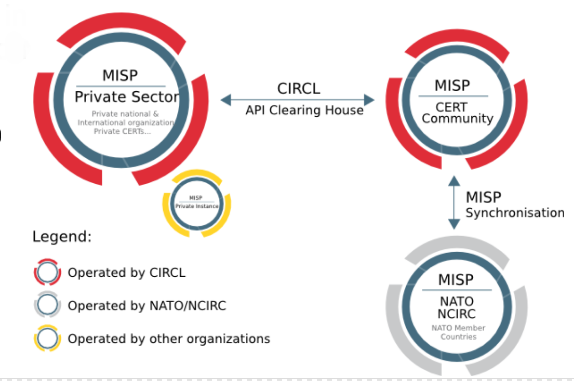 MISP has several organisation "pools", one for local and one for known external organisations. When adding a synchronisation connection, you need to define the host organisation of the remote instance. Select which pool you wish to pick the organisation from using this drop-down. You also have the option of adding a new organisation directly from this interface. Choose the organisation from the selected pool that defines the host organisation on the remote side. Make sure that the remote instance is actually run by the organisation you select as this is used in an integral part of the sharing mechanism. Do not select your own organisation for this setting. You can find the authentication key on your profile on the external server. Allow the upload of events and their attributes. That means only Events that match the given filter will be pushed to the server. Allow the download of events and their attributes from the server. That means only Events matching the given criteria will be pulled. E.g. it can limit to NOT download Type:OSINT events. Test connection can be used to test the connection to the remote server and will give a feedback about local and remote version of MISP. Rules are used to limit sharing when synchronising events and attributes, to e.g. 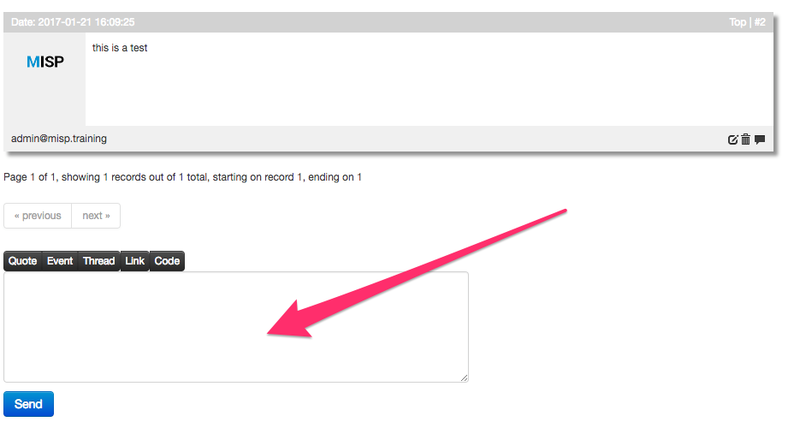 events with a given tag, or disabling sharing for events containing a certain Tag. if you have a SSL connection issue to a remote server with a signed by a CA that is not included in OS, make sure the whole certificate path is included in the path. The following section describes how distribution mechanisms of events and attributes work. The below five distribution settings are available for events and attributes. Descriptions of those settings can be found here. 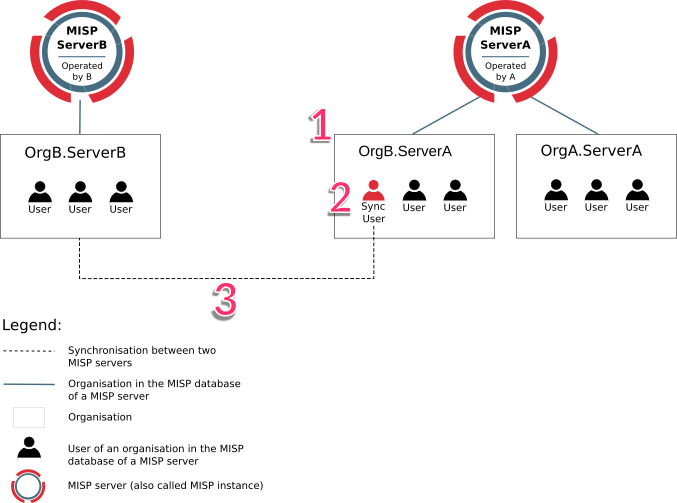 Events that are not published are only distributed/shared to the local organisations on the same MISP server/instance (within the limit of the distribution model). Only events that are published will be shared with remote organisations on other MISP servers via push/pull mechanisms. More details on publishing events here. A community is composed of the local organisations on a MISP server and the remote organisations connected by the sync users. For more information on the concept of community, refer to an article on MISP information sharing following ISO/IEC 27010, explaining the concept of community. Specifically, communities are not reversible. Taking the example of the above figure, illustrating the synchronisation between two MISP servers, OrgB.ServerB is part of the MISP ServerA community but OrgB.ServerA is not part of MISP ServerB community. [!] This rule does not apply if “Internal instance” has been checked when creating the server. As an example, the figure below illustrates two events e and e&apos; created by OrgA and respectively shared as "This community only" and "Connected communities" and how they propagate in an illustrative MISP set of intances synchronised with each others. 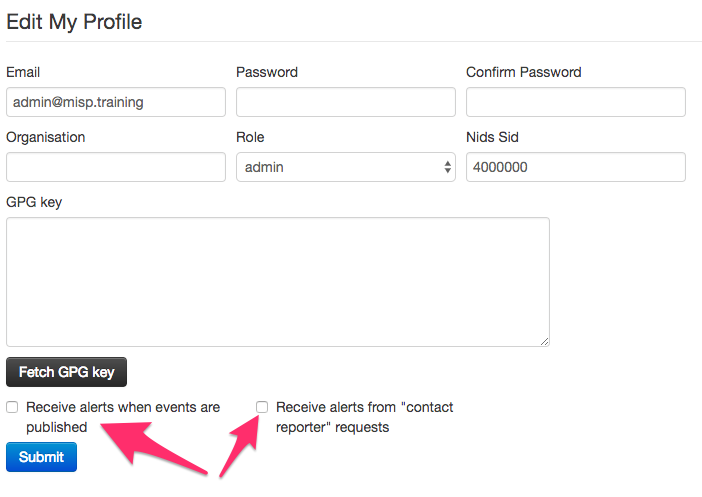 Proposals can be used to propose new attribute values that can be reviewed by the event owner. Forums can be used to discuss non event related topics. 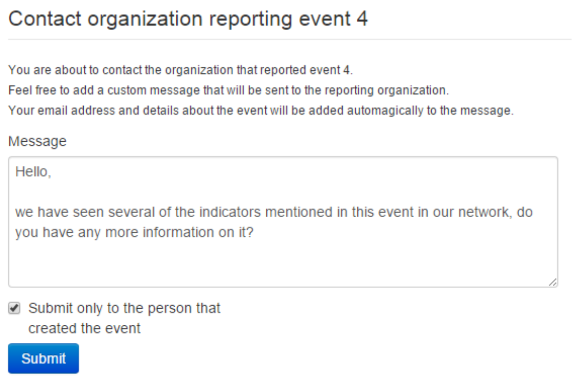 Discussions can be accessed on the top "Global Actions - List Discussions"
This feature can be used to contact the person or the organisation that the person belongs to that has created the event. The following section will describe what is the best practice how many MISP instances that showed to be good for orgs. Of course depending on your specific requirements an architecture could be more spread or simplified. This systems purpose is to be linked to all available external MISP systems that you have access to. It will download all events and do enrichment between these events. This system is the main system used by human analysts. It will it is not linked to any external MISP instance other then the Staging System.